The HP A526 looks like a baby toaster. 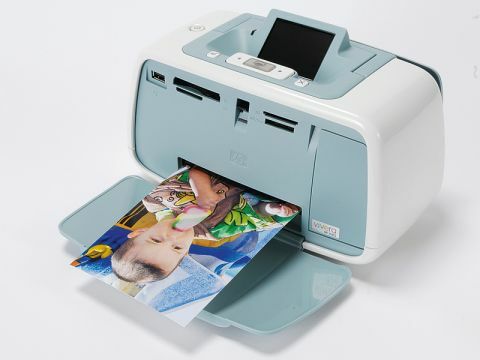 Not only does it occupy a much smaller desktop footprint than many rival printers (and especially the dye-sub printers), it's dramatically cheaper, too, undercutting the next-cheapest by nearly £30. So is it any good? It certainly is. There's a bit of a gulf between the quoted print time (39sec) and our actual print times (87sec), but the quoted times are for prints with borders, where our test prints were borderless. The print quality was impressive, especially given the price. In our portrait test, the A526 proved almost as good as the Epson, with just a shade less contrast but equally vivid colours. Its landscape shot had slightly more vivid greens and good tone in the blue sky. The A526 doesn't do much, but that means it's so simple that anyone could use it.